A quick post but one that is needed. I happened upon this bottle in DC and felt compelled to buy it. An unchill filtered whisky is one that is bottled without being “refined” so that it doesn’t change color or cloud up when someone adds ice to it, which should never happen btw. So this is as pure as you can get your whisky. It’s really something that aficionados enjoy because you really get the feel for what actually comes out of the cask. For me, this Bowmore has better mouth feel and reminds me of Loch Indaal at Bowmore. 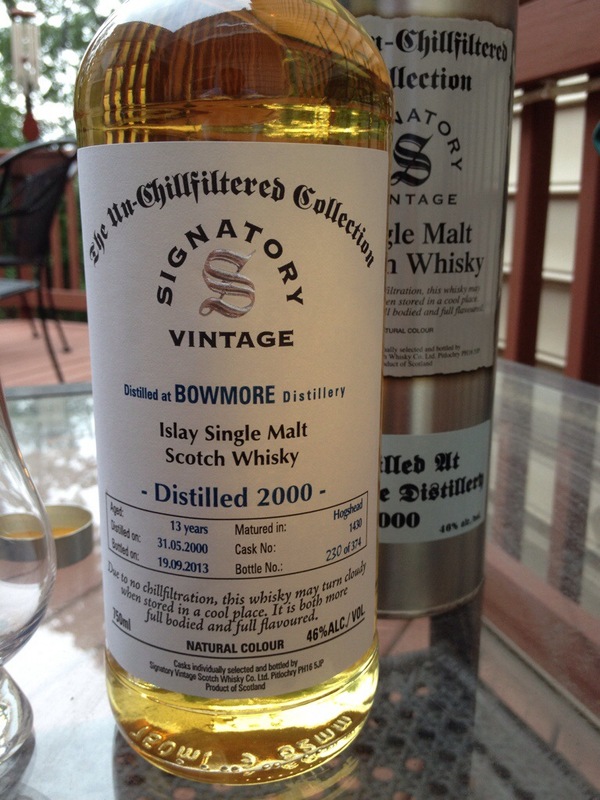 I really wish this would come in the standard Bowmore line but alas, Signatory has done us all a favor bottling this one as God intended it. This bottling was done in September of 2013 after 13 years of aging. It was matured in a Hogsheads cask and is from cask #1430. It’s bottled at 46% ABV and is great with a splash of water. Classic Bowmore lemon zest and salt come through on the palate but the real pleaser is the excellent mouth feel and finish from the lack of filtering. If you can find it you’d be well if buying. I’m keeping my source secret for now! Cheers! Is it close to Nadurra? I think you are referring to The Glenlevit offering. No. Bowmore is a classic peated whisky and as Islay whisky goes, quite different from a Highland or Speyside whisky. Yes, it appears the same unfiltered process. Had the Nadurra once and loved it! Well if you find yourself a couple of blocks away from the Senate offices, there is a great little spirit and wine store off D street! Are you talking about Schneider’s?